In August 2014, French leasing company Akiem made public that they had ordered ten Traxx DC locomotives with Bombardier. An option was taken for ten more. This option was exercised in the months that followed. Total value of the contract is approximately 65 million euro. In 2016 five more locomotives were ordered, bringing the total to 25. In 2015 Bombardier started the production of first TRAXX DC's for Akiem in its Italian factory in Vado Ligure. At the end of October the first locomotive was ready, being the designated Akiem 483 301. The locomotives with the Italian package are numbered as 483 3xx series. The five units that go to Poland get a Polish style NVR designation: 5170 060-064. Yesterday, Akiem 483 222 / 5170 061 arrived in Poland after being repaired by Bombardier in Kassel. The locomotive was damaged after an accident in Lubin in December 2016. In April 2017 the machine was transported to Kassel on Loco Buggies. In Germany the TRAXX was pulled by Delta Rail 243 559, in Poland the DC loco ran under its own power. Akiem TRAXX DC locomotives 483 316-320 will all be hired to Mercitalia Rail. This week, a line-up was made of these five machines still being under construction. Today a silver TRAXX DC locomotive entered Germany on RailAdventure's Loco Buggies. The image and video show Akiem 5170 061 (a.k.a 483 222) with Pol-Miedź-Trans logos, most likely on its way to Kassel (?) where Bombardier will repair the damaged locomotive. The 061/222 was involved in an accident with freight cars in Lubin in December 2016. Akiem, the European leader in locomotive leasing, has acquired German company mgw Service, a major independent player in electric and diesel locomotive maintenance in Europe. The transaction covers the entire share capital of mgw Service and was signed at the end of 2016 by Antje Wallraff and Klaus Weiss, the founding partners and heads of mgw Service, and Fabien Rochefort, Chief Executive Officer of Akiem. mgw Service provides preventive and corrective maintenance for locomotives on behalf of rail freight and passenger operators. The headquarters of the 70-strong company is based in Kassel (Hesse State). It operates mainly in Germany from its own workshop in Krefeld (North Rhine-Westphalia State) and in Sweden (Hallsberg, Orebro County), but also in Switzerland, Italy and Poland. mgw Service possesses the skills, equipment and spare-part logistics required to cover an extensive range of electric and diesel locomotives. It generated estimated 2016 revenue of close to €20 million from a broad portfolio of private and incumbent operators. This external growth transaction is part of Akiem’s programme to accelerate its expansion in Europe and step up its investment in new locomotive fleets capable of serving from Germany to Central Europe, Sweden, the North Sea area, and Italy. This will enable Akiem to reinforce its leasing with maintenance offering. mgw Service’s current managerial team will remain in place and the company will continue to operate under the name mgw Service. The complementary leasing and maintenance activities will enable Akiem and its subsidiary, mgw Service, to expand their networks and broaden the nature and level of performance of the services they provide to European operators. “We are extremely satisfied with this transaction, which gives mgw Service the support of a European leader like Akiem. Our company’s growth is now assured by once again expanding our European base so that we can serve all our customers with ever more dedication and commitment,” said Klaus Weiß, CEO of mgw Service. Signed on 28 December 2016, the acquisition should come into force following the decision of the European competition authorities, which is expected for the end of the first quarter of 2017. On 03.01.2017, two new Akiem electrics completed their maiden run Vado Ligure > Genua and back. 483 314 and 315 are now both hired to Mercitalia Rail. Dinazzano Po from Italy will be hiring the next new Akiem TRAXX DC locomotive: 483 313. It was out and about this morning and it has an orange DP livery. This is TRAXX DC no.5 for Akiem and PMT. It will soon re-appear in Poland with a new number in the 5170 0xx series. The fourth TRAXX DC locomotive for Akiem on its way to Poland. There it will be tested at the Zmigrod test center for approval by the Polish UTK. Thanks Normann. Lease company Akiem has confirmed it has exercised an option for the delivery of five TRAXX DC locomotives, related to a previous contract. This brings the total of TRAXX DC machines, equipped for Italy or Poland, in the fleet to 25. At this moment Bombardier has completed 11 Akiem locomotives for Italy (483 301-311) and 3 machines for Poland (5170 060 and 483 222-223). Ready to go. Alpha Trains > DB Cargo 483.008 is ready to depart. Behind the turqoise locomotive, you see the new Akiem 483 223. The machine will go to Poland, no.3 of its type for Akiem, which will be hired to Polish operator Pol-Miedź Trans. Thank you Beppe Russo. The second Akiem TRAXX DC locomotive has arrived in Poland. It cam from the Bombardier factory in Vado Ligure in Italy. It has the temporary designation 483 222 and is painted silver. Soon it will get immatriculated in Poland and receive a new Polish NVR number. It will be hired to Pol-Miedź Trans. All five Akiem TRAXX DC's on order will be operated by this Polish operator in the future, three more to come. Thanks Torsten Frahn for the image. New in the fleet of Akiem and Captrain Italia: 483 310. Thank you Simone Facibeni. Last week, the first TRAXX DC locomotive for Akiem arrived in Poland. The silver painted Akiem E 483 221 was transferred from the Bombardier factory in Vado Ligure (IT) to the Zmigrod test centre (PL). A Polish NVR number still needs to be applied. Five Akiem TRAXX DC's will be built for services in Poland. As of March 2016, Deutsche Asset Management (Deutsche AM) will hold a 50% stake in Akiem. At this moment, the Franch leasing copany is a 100% subsidiary of the Ermewa Group, part of SNCF. Together with Deutsche Asset Management (Deutsche AM), Akiem wants to expand its activities in Europe, a double its fleet in the next ten years. The first four Akiem TRAXX DC locomotives (the designated 483 301-304) have been delivered and are now in service of Captrain Italia. 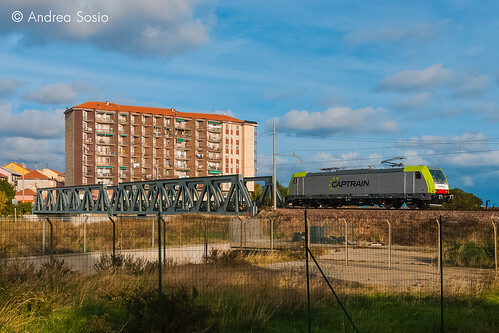 The image shows 483 302 with a freight train from Torviscosa to Rosignano at Gaggio Porta Est near Venice. (Foltran Renato). Over the next months, Bombardier will supply 15 Traxx DC locomotives to lease company Akiem. 12 of these will be rented to Captrain Italy. First two for Captrain are 483 301 and 302, and both had their maiden run today. Ferrovie.it reports: By the end of this month, Bombardier in Vado Ligure will deliver the first Traxx DC locomotive to lease company Akiem. In 2014, Akiem ordered 10 (+10) option Traxx DC machines, that traditionally are being built in Italy. Soon, the option became a fixed order so now Akiem will get 20 electrics of the type in 2015 and 2016. On 08.12.2014, a family day was held at the Bombardier Vado Ligure works. This provided a quick peek into this factory in then north-western part of Italy. This year Vado Ligure focused on revamping passenger coaches for Trenitalia, combined with a lot of engineering work for the Zefiro-V300 Freccia Rossa high speed trains. However, in the past months the construction of new locomotive was set up again. Three orders will be processed in Vado Ligure. Two project have started. GTS Rail: The Italian open access freight operator has two additional Traxx DC locomotives on order. E 483.056 is under construction now. E 483.057 will be next. Trenitalia: This year, Italian state operator Trenitalia decided to expand its Traxx DCP fleet once more. Another 29 units are on order, the designated E 464.689 to E464.717. These machines get the new blue and silver 'regional' livery of Trenitalia. Akiem: This French lease company has ten Traxx DC locomotives on order. There is an option for ten more. Their production still has to commence. Akiem paints all its locomotives plain silver. But in Italy, trains need a red accent on their fronts. How to solve this? Our proposal. The image above is a Railcolor/Crearail.com creation. It is not based on any information from Bombardier, nor Akiem. Original picture by Sebastian Schrader. Rail technology leader Bombardier Transportation and the leasing company Akiem S.A. have signed a contract for the delivery of 10 BOMBARDIER TRAXX DC locomotives, with an option of up to 10 additional locomotives. Based on list price, the firm order is valued at approximately 33 million euro (44 million US) the total potential contract value if the option for 10 additional locomotives is exercised would be approximately 65 million euro (86 million US). The locomotives will be used for freight transport in Italy and Poland. Delivery is scheduled between the third quarter of 2015 and the first quarter of 2016. It will expand Akiem’s TRAXX fleet of 15 locomotives that were ordered in 2013. In Poland alone around 70 TRAXX locomotives are in operation - the largest fleet of state-of-the-art locomotives currently operating in this country. In Italy more than 100 TRAXX locomotives are in use. “This contract is a new step in Akiem's European development, this fleet of pure DC3kV TRAXX is answering customers’ requirements for a cost efficient and reliable traction solution in both Polish and Italian domestic markets. This contract is the result of a real partnership with Bombardier, all our new 3kV TRAXX’s customer will benefit from the skills of Akiem engineers and Akiem’s spare-parts and components storage which we developed with our previous AC and MS TRAXX fleet” said Fabien Rochefort CEO of Akiem. The locomotives are designed for speeds of up to 140 km/h and are well known for their high reliability, excellent traction capabilities, energy efficiency and low maintenance cost. Bombardier will assemble the locomotives in Vado Ligure, Italy. The carbodies are manufactured at Bombardier’s Wroclaw site in Poland, the bogies in Siegen, Germany, and traction converters in Trapaga, Spain. Railcolor: Main question is, will Akiem get Traxx DC(2e), also known as the E483 series, or are we talking about the still to be presented DC3, possibly with Last Mile shunting module? Looking at the reasonably short delivery time (16 months) most likely this order concerns the proven DC(2e) variant.